Some people think that a clock with an alarm was first made in Germany. That alarm clock was made in the 1400's. It was a clock that hung on the wall. 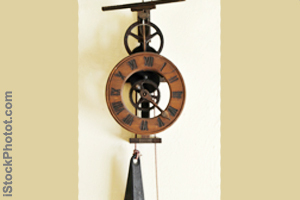 The clock was made of iron with a bronze bell. It was very heavy. 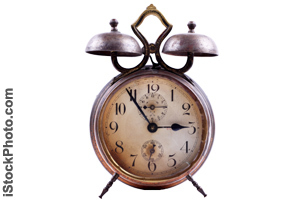 The first small alarm clock was invented in Turkey. In 1559, a scientist named Taqi Al-Din invented a special clock. 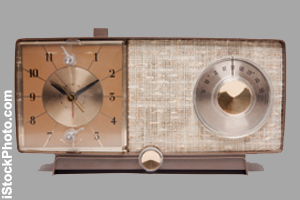 In 1787, a clockmaker from New Hampshire made a clock that would sound an alarm. His name was Levi Hutchins. He invented a clock that would wake him for work. It was very big. The alarm clock only rang at 4 o'clock in the morning! 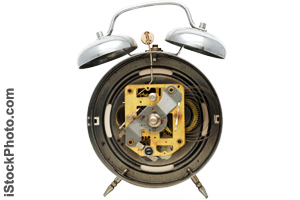 The alarm clock that we know today was first made in 1876. That was when clocks made to sound an alarm at a certain time were first made. Today there are many kinds of wake-up alarms. One alarm clock gives an electric shock. 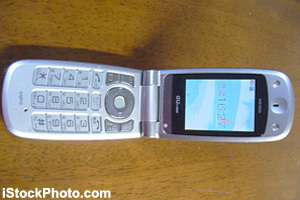 Another alarm clock makes the bed bounce when it’s time to wake. The Alarm-O-Bed lifts one side of the bed and tosses the sleeper onto the floor. An alarm clock can wake you with music. 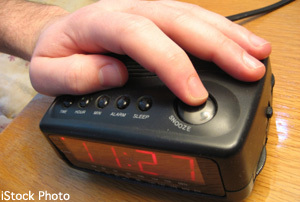 Another kind of alarm clock has a button to turn off the alarm for a short time before it rings again. It is to allow just a little more sleep. It is called a snooze alarm. One kind of alarm speaks. Another alarm clock has wheels and hides itself. You must find the clock to turn it off. Alarm Clock History. Clock History: Westclox, Seth Thomas, Standard Electric Time Co, Telechron, clockhistory.com/alarmClockHistory/. The Evolution of the Alarm Clock. Van Winkle's, vanwinkles.com/a-brief-history-of-the-wake-up-call. 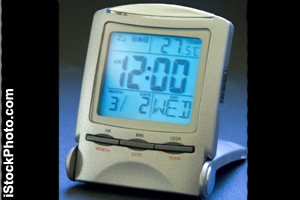 History of Alarm Clocks by @onlineclock. Alarm Clock Blog, blog.onlineclock.net/history-of-alarm-clocks/. MLA Style: "Alarm Clock: Taqi Al-Din." Facts4Me. Feb. 2017. http://www.facts4me.com.